Having trouble understanding how circuits work? Try working through this analogy. Current, charges, energy, an ammeter, a battery and a lightbulb are all being represented in this analogy. What is representing each concept or circuit component? 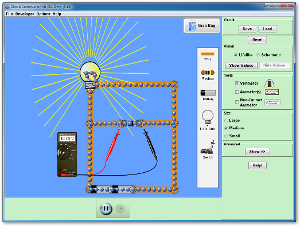 You can use the simulation below to build and explore different circuits. Review your ionic and covalent bonding here. Review ionic, covalent and metallic bonding here. You can see what happens when a voltage is applied across a sample. This entry was posted in Electricity, Grade 10 Science and tagged Electricity, grade 10 on October 7, 2015 by Merilyn Winslade.